What is creative thinking, and why is it important in the workplace? Most people associate creativity with artistic tasks such as writing a novel, painting a picture, or composing music. While these are all creative endeavors, not all creative thinkers are artists. Many jobs require creative thinking, including positions in the worlds of business and science. Creativity simply means being able to come up with something new. Therefore, creative thinking is the ability to consider something – a conflict between employees, a data set, a group project – in a new way. Employers in all industries want employees who can do this. Be sure to highlight your ability to think creatively in your job applications. To do this, you first need to recognize your own creativity. Creative thinking means looking at something in a new way. It is the very definition of “thinking outside the box.” Often, creativity in this sense involves what is called lateral thinking, or the ability to perceive patterns that are not obvious. The fictional detective Sherlock Holmes uses lateral thinking in one famous story when he realizes that a dog not barking is an important clue in a murder case. Creative people have the ability to devise new ways to carry out tasks, solve problems, and meet challenges. They bring a fresh, and sometimes unorthodox, perspective to their work. This way of thinking can help departments and organizations move in more productive directions. For these reasons, they are extremely valuable to a company. Some people are naturally more creative than others, but creative thinking can be strengthened with practice. You can develop creative thinking by solving riddles, being aware of (and letting go of) your assumptions, and through play. Play connotes anything unstructured and relaxing such as daydreaming. If there is someone in your industry who is known for being creative, you might to try to connect with that person and ask for an informational interview, or ask to job shadow him or her for a day. Watching someone work in creative ways can help you learn to be more creative yourself. Some job descriptions state that creative thinking is required for the position. However, many employers want creative thinkers even though they haven't articulated it. In either case, think about how your creative nature has helped you in the past and how it might be an asset in the job you're seeking. One way to highlight your creative thinking is in your application materials. In your resume and cover letter, consider including keywords that demonstrate your creativity, such as “fresh” and “innovative.” In your cover letter (and even in the “Employment History” section of your resume), include one or two specific examples of times your creative thinking added value to your company. For example, perhaps you came up with a creative way to save your department money, or maybe you developed a new filing system that increased efficiency. Also come to your interview prepared with specific examples of how you're able to demonstrate your creativity, just as you would with any other skill. This is especially important if the job description lists creativity or creative thinking as a requirement. If you're looking for creative opportunities as a means of personal fulfillment, you can find satisfaction in surprising places. Any job that allows you to put your own spin on your work will end up being creative. Before thinking creatively about something, you first have to be able to understand it. This requires the ability to examine things carefully to understand what they mean. Whether you are looking at a text, a set of data, a lesson plan, or an equation, you need to be able to analyze it first. Creativity involves thinking of things no one else has considered before. You have to set aside any assumptions or biases you may have, and look at things in a completely new way. By coming to a problem with an open mind, you allow yourself the chance to think creatively. Employers don’t simply want to hire creative people because they are impressive. They want creative employees who will help them solve work-related issues. 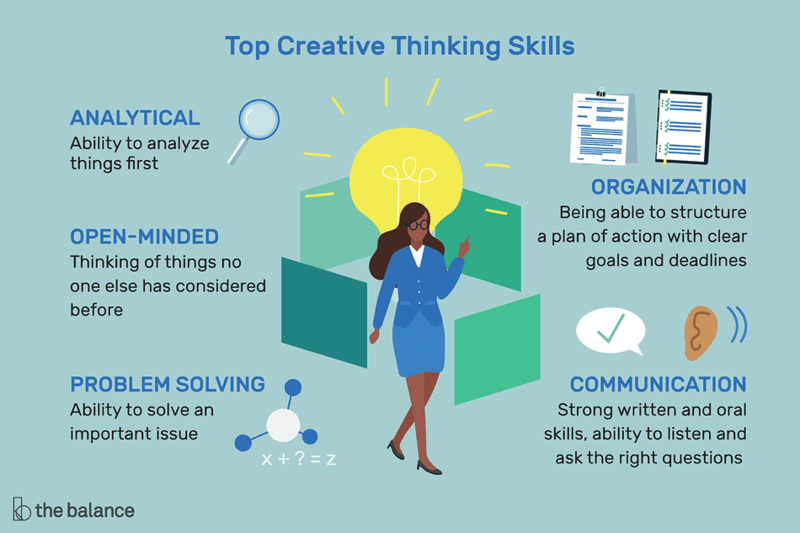 Therefore, when applying for jobs, highlight your ability not only to think creatively, but to use your creativity to solve an important issue. This might seem counterintuitive: aren’t creative people known for being somewhat disorganized? Actually, organization is an important part of creativity. While you might need to get a bit messy when trying out a new idea, you then need to organize your ideas so that other people will be able to understand and follow through with your vision. Being able to structure a plan of action with clear goals and deadlines is vital. People will only appreciate your creative idea or solution if you can communicate it effectively to the people you work with (or your clients or vendors). Therefore, you need to have strong written and oral communication skills. You also need to be able to fully understand a situation before thinking creatively about it. Therefore, you also need to be a good listener. By asking the right questions and understanding the problem, you can come up with a unique solution. Opportunities for creative thought in the workplace vary from the obvious artistic position to the highly technical one. Generally, anything that involves an “aha” moment is considered creative. Here are some examples of how to display creative thinking in different jobs. You don't have to be an artist for your work to have an artistic element. Perhaps you arrange retail displays for maximum impact, or shape the path of an enticing hiking trail. Other artistically creative tasks might include designing logos, writing advertising copy, creating the packaging for a product, or drafting a phone script for a fundraising drive. Creative problem-solving stands out as innovative. A creative problem solver will find new solutions rather than simply identifying and implementing the norm. You might brainstorm new ways to cut energy use, find new ways to cut costs during a budget crisis, or develop a unique litigation strategy to defend a client. These all entail creative thinking on your part. Some people think of science and engineering as the exact opposite of art and creativity. However, the opposite is true. The field of STEM (i.e., science, technology, engineering, and math) is highly creative. For example, designing a more efficient assembly line robot, writing an innovative new computer program, or developing a testable hypothesis are all highly creative acts. In fact, the history of science and technology is filled with projects that did not work, not because of errors in technique or methodology, but because people remained stuck in assumptions and old habits. STEM fields need radical creativity in order to flourish and grow.